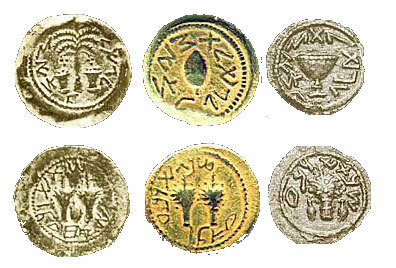 During the revolts, when messianic expectation was a key rallying point, the coins used the more unusual term (Geulah instead of Shmitta) for the sabbatical year of Leviticus 25 which specifically deals with the agricultural rules, as opposed to the passage in Deuteronomy 15 which deals solely with the rules of lending, debt and slavery. This term Geulah may also have been used to bolster the messianic expectation of the period. The Messiah as the GOEL/Redeemer would arrive during a Sabbatical year or in a Jubilee year to redeem his people from debt, slavery and oppression and to atone for their sins before God. During other, non-sabbatical, years the term “freedom of Zion/Jerusalem” was used instead. During the first year of the Second Revolt, a sabbatical year, the term Geulah was not limited to the bronze denominations but was added to silver coins as well. The rabbinical text which deals with issues of chronology, Seder Olam Rabba, states that the year preceding the fall of the Temple (69/70 CE) was a Sabbatical Year. Bronze coins during years two and three of the First Revolt were inscribed Herut tsiyon “the freedom of Zion” which changed with minting of several new bronze issues during year four to Shnat arba lege’ulat tsiyon “Year four of the redemption of Zion”. The term “Redemption” carries more messianic connotations than HERUT/Freedom since the Messiah is to appear as GOEL/Redeemer. More to come on these special issues of coins. . .